Come to Vinkovci, Slavonija Croatia. Maybe there are some leftovers. the world`s longest sausage was made, measuring at 530 metres. VINKOVCI, CROATIA – The longest sausage in the world, measuring at 530 metres, was presented in the Eastern Croatian town of Vinkovci by the members of the `Slavonian Home Kulen-Kulin` association, as part of the `Come to Vinkovci` project. The sausage was fried in a vast 2.5-metre pan and was distributed to Vinkovci citizens once it was done. Other treats were available for the gathered crowd to enjoy, such as home wine and doughnuts. Vinkovci citizens are planning to contact the Guinness book of records in order to break the current Romanian record, who prepared a nearly 400-metre long sausage. 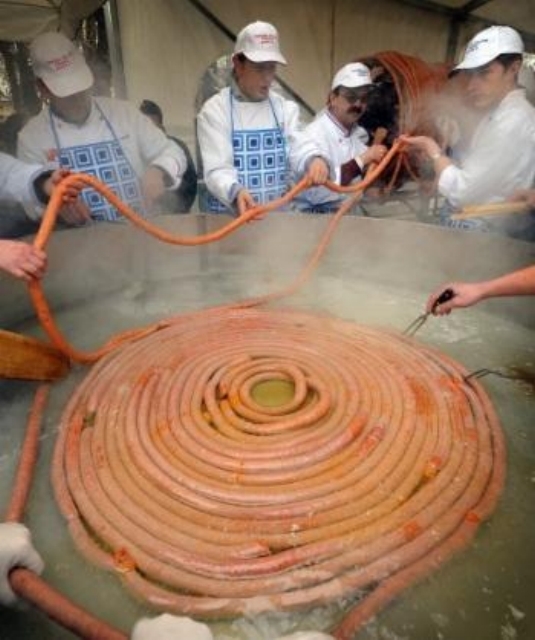 You can see the giant sausage in the attached photo gallery: World`s Longest Sausage Made In Croatia (530m). Croatian Isle of Love, Galesnjak. Distributed by www.Croatia.org . This message is intended for Croatian Associations/Institutions and their Friends in Croatia and in the World. The opinions/articles expressed on this list do not reflect personal opinions of the moderator. If the reader of this message is not the intended recipient, please delete or destroy all copies of this communication and please, let us know!...or simply enjoy.